Fisical Project & Ryan K return to ART Recordings! 'Until I Find You' is better than it has any right to be and to date has been doing some serious damage on the trance circuit. Superb peak time material! 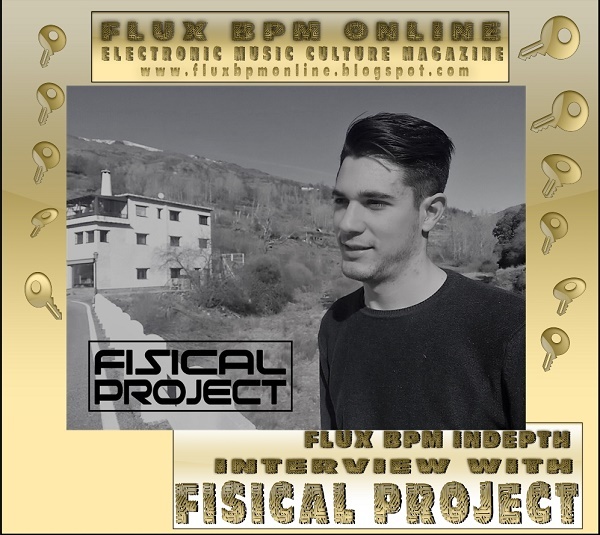 It is great pleasure that Fisical Project from Granada, Spain has accepted the challenge to talk about this release on our interview that you can read right here & right now. Fisical Project: Everything began in 2010; In my town they have always done a djs contest, and my mother wanted me to participate. The truth is that I had never heard about electronic music. Even though I did not know anything, I try to do what I could, after that started to find djs on internet, and started to listen DJ Tiesto. When I discovered electronic music, I started to feel that it was the energy I needed, since during those years of my life, I was totally alone, fighting against abuse and bullying at school. For me trance always will be my style, was the music that I discover and helped me to stay here. But I really like to listen all kind of music, It helps you to learn more. Fisical Project: This a good question, cause of I started to create my music alone, and trying to improve always my sound, I watched many tutorials on YouTube, like the Adam Ellis ones, but my main point was asking for feedback, my friend Borja aka Dim3nsion helped me a lot when I started to make music. I think It is not essential, you can learn easily nowadays there are a lot of tutorials, but always will be more easy to learn with a course, of course. Fisical Project: The truth is that before signing on TFB, which by the way, now they change its name to Ultima Audio, I signed on other labels before, but I do not consider these tracks as real songs. That's why I always I say TFB was my first records label. If I remember correctly, a friend talked with them, because it is a record label from my country and they liked the track. Dimitri: Let's focus on your track Until I Find You by Fisical Project & Ryan K on ART Recordings. Please tell us from where did you got the inspiration for the track? Fisical Project: I think the title says it all: "Until I find You" , I was inspired by the happiness that my couple transmits to me. Thanks to her, I think I have improved a lot this year, She is a big part of my motivation. Fisical Project: I think that approximately, Ryan and I took less than a month to do it, the truth is that it was a track in which, we had no problems with the mixdown. Fisical Project: I think it was, having to export all the sounds to wav to work it better. It is very complicated to work with a laptop when it is a not good one. Fisical Project: We usually start working with the main idea of ​​the song, once you have the main melody, it is very easy to start working on the breakdown and the drop, and afterwards, it is simply to work the mix. You can also start with the introduction of the song, but it's easier and more motivating when you have the main melody. Fisical Project: This time ART Recordings liked a lot, and we did not change nothing. Fisical Project: It is 100% our work, we do not like to copy and paste like maybe other artist do, or to use ghost producer (I am the ghost producer). I always want to make new stuff, try to find new sounds, and innovate to do not make boring tracks. To say the truth I am always focus in make new sounds, and try to add other sound by others kinds of music. Nowadays we need innovate the music we like to stay here. Fisical Project: I usually say this is my "best track", when you work hard every day, you improve a lot your sound, and the feeling is great, always you can improve your ideas skills, and your sound quality. I think this one sound much better, if you compare with the music I did last year. Fisical Project: Yes of course, I have some friends that help me a lot with their feedback, like Eugenio Tokarev, Aldo Henrycho, Walter Armas and Raul Mad, they all are great friends and talents. I will have the opportunity in a few days to test it live! Fisical Project: Well my studio is just a laptop (Acer Aspire E 15, i7) and a good headphones (Audio Technica MX50). I don't need more at the moment, but I would like to have a better laptop to work without wavs. Fisical Project: This time my friend Duncan Newell did the mastering, he is very professional working the right labels and compression, but sometimes I do my own mastering yes, but I am not as good as him. Fisical Project: If you are a music lover you always want to have your music in the best quality, and of course will be great to have a track in vinyl. Fisical Project: In September I will release new tracks on Extrema, Redux and Tangled Audio. This year I will release 17 tracks, and many tracks in coming with Nathia Kate. Dimitri: When your long awaited DJ debut will be? Fisical Project: My DJ debut going to be next 20-22 of July In "Sunrise Trance Meeting" here in Spain. Fisical Project: When I started to produce I had two shows, but with the time I left they, not many time. But I hope soon start a new radio show. Paul van Dyk: " Do what you like, and love what you do"
Eugenio Tokarev: "Your next track is your better one"
Dimitri: Please give us your tips or more elaborated advice for any new artists who may read this interview and wish to get involved with the electronic music industry. Fisical Project: Do not just listen to a type of music, learn from it. Compare your music with that of other artists. Be hard with your feedback. And do what you like, innovate your sound. Many thanks to Fisical Project for this interview and we wish him all the best in his future career.